If you are a coffee fan looking for a coffee grinder that is economically priced, but still manages to provide good value and a fresh grind for your morning cup, then the Proctor Silex E160BY Fresh Grind might be for you. At less than $20, the value for this product is practically unbeatable. 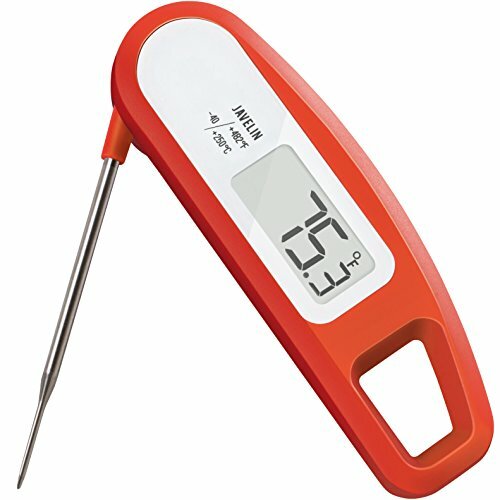 Made by Proctor-Silex, an appliance company that’s been in the business for over fifty years, you know that this product (like all their products), have been rigorously tested in the lab before hitting the stores. 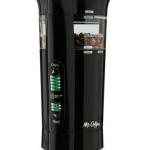 That is why this model of coffee grinder meets North American Electrical Standards, which cannot be said for similar products. We’re not about to review any product without talking about the good and the bad, and some folks have definitely had their share of difficulties with this grinder, so in this review you’ll learn a lot about the Proctor Silex E160BY; some things you definitely need to know, and maybe even more! When you purchase this popular blade grinder, you’re getting 1.2 lbs / 7 inches of grinding muscle right there in your kitchen. You might think, “that doesn’t seem like a whole lot of muscle.” Well, relative to its size, it is. 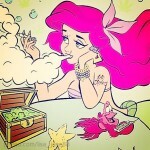 Our sentiments exactly. This grinder is designed to be compact, so that you can easily store it, clean it, move it, and operate it. On the product page, the folks at Proctor-Silex refer to it as a “precision grinder”, which means that its kind of on the smaller side, yes, but you can focus on perfecting smaller doses of grinding. Some users even get some good use out of it grinding spices, and things like flax seeds. The capacity of this grinder is definitely not huge. 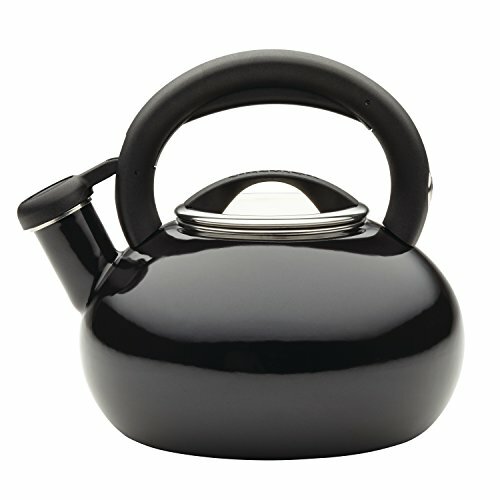 If you pack this thing to the gils, it still would take two cycles of grinding to get enough grinds for your 10-cup coffee maker. So, for those of us who aren’t particularly in a big hurry, or wanting to grind large quantities of coffee beans at once, the Proctor-Silex does just fine. 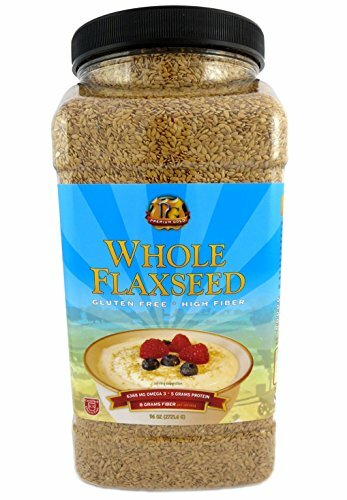 Grinds Flax Seeds, Spices, & More! 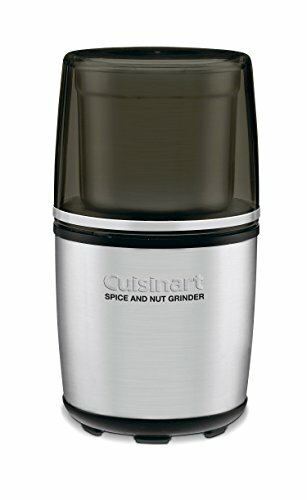 One thing we’ve noticed in our research is that this blade coffee grinder seems notorious for being a device that people will throw almost anything into, as it is advertised as a spice grinder as well as a coffee, specifically. There is mention of grinding not only coffee beans, but flax seeds, peanuts, and any number of other grind-ables. 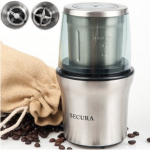 Most users confirm that this grinder is a gem when it comes to grinding things, but it would also seem that people do take the all-purpose nature of this grinder quite literally, and this might be leading to the sometimes premature demise of this not-indestructible coffee grinder. At the end of the day, consistency seems to be very good (you might even say surprisingly good) for this small grinder. Most users report that almost any grind they are trying to achieve is quite possible with the Proctor-Silex E160BY. 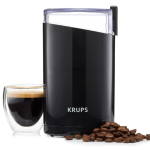 The range of grinds includes your standard three – coarsest for French Press, relatively coarse for drip coffee / percolator, and fine grind for espresso. The majority of users seem to have no issue getting the grind consistency they’re looking for, but at this price point, its not shocking that not everyone can get exactly what they want. 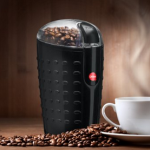 Proctor-Silex claims that this cute little coffee grinder is easy to clean, and so do some fans In fact, that is supposedly one of its key features. In spite of this fact, G.E. Wood gave the grinding 4 out of 5 stars, suggesting that he/she has a bit of a love/hate relationship with the small, white coffee grinding unit. 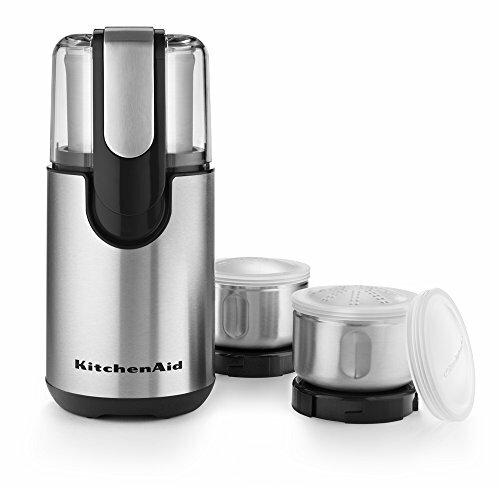 Other users find removing the lid and wiping the tiny grinder down to be quite simple. Some users have a beef with saying that the E160BY isn’t a “fine grind” type of grinder. 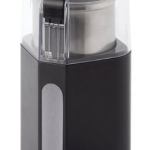 Well, if you are a true fan of espresso, chances are you will not be looking at this grinder as an option to begin with, as it is only around $20 and one cannot reasonably expect a blade grinder to do this job consistently. That said, some users have found a way to make it work. Here’s a quick video demonstrating how to get some of those finer grinds with a little bit of shaking. For the most part, people have been enjoying their Proctor-Silex blade coffee grinder for many weeks/months/years without incident. It would seem that despite not being an expensive burr grinder, many users do just fine with it over time. After all, it can grind coffee beans and flax seeds every day and still keep on truckin’. That’s pretty good! That said, we must say again that this is only a $20 grinder so we think that with that price tag, you do get a great value, however grinders like this were never built to last forever, sadly. Our review of this grinder boils down to just a couple of facts here. 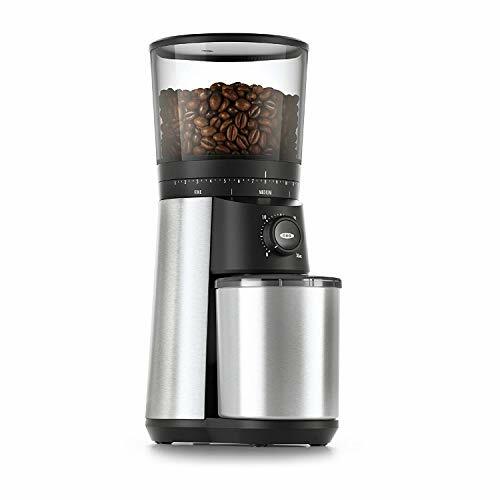 One is that you are paying less than $20 for a coffee grinder that many people enjoy using. It is a trooper of a grinder, that’s for sure. 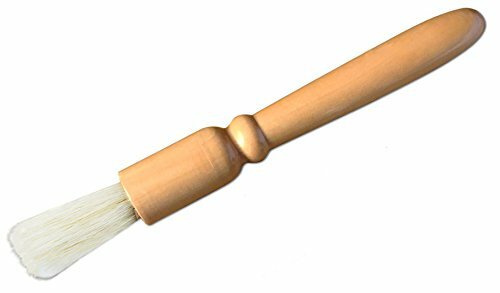 That said, people have their nitpicks about this small kitchen utensil and most of them fall in the department of it not being the most versatile machine. 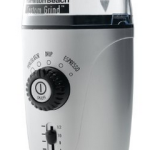 This may be true, in that it doesn’t come with lots of grind settings or any features that you get with more expensive burr grinders, but hey, it is a $20 blade grinder, and it needs to be cut some slack. 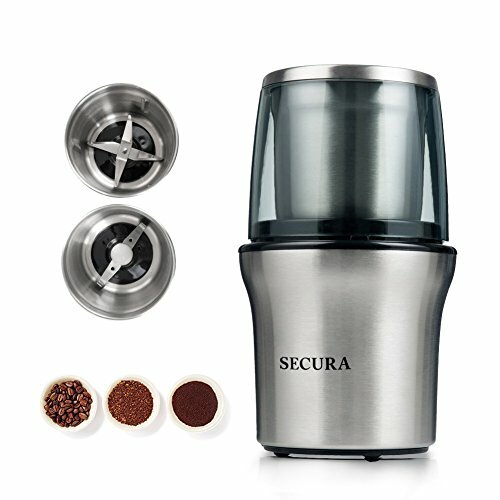 Below you will find links to fancier grinders if you are more into espresso or grinding for diversity. For those who simply want better tasting coffee at home, and no mucking around, the Proctor Silex E160BY is definitely work a go!